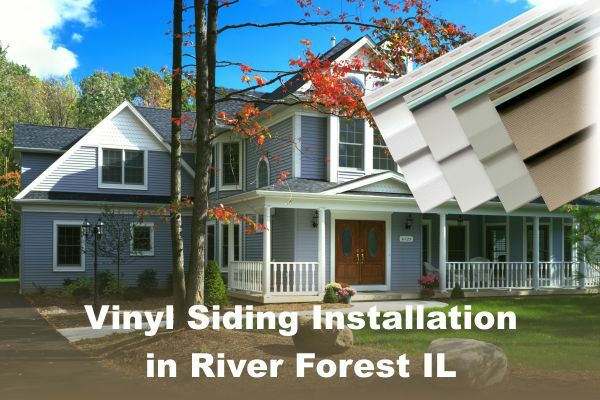 Considering Quality Vinyl Siding Installation in River Forest? We will never share your information with anyone. Complete the form below or give us a call NOW for a free, non obligatory quote on installation of a new, beautiful wall finish on your River Forest house. Does your house vinyl siding in River Forest require replacement? Are there any damaged areas that affect energy efficient performance of your house walls? Let us perform a free, non-obligatory evaluation of your existing wall finish condition and present all available options which can significantly improve energy efficiency and curb-appeal of your property. EDMAR Contractors Inc. has been performing vinyl siding installation in River Forest for decades. If you are looking for a River Forest IL siding contractor to replace your existing or perform completely new siding installation on your home, give us a call NOW. We’ve been always dedicating our efforts to provide each and every homeowner with the highest quality service on all vinyl siding installations in River Forest, no matter how big or small that job can be. Take some time to check what others are saying about our services: EDMAR Contractors reviews, and explore other types of siding installations we offer in River Forest IL. called Edward to check on my destroyed siding and he seemed much nicer and more knowledgeable than the other guy who also gave me an estimate. I didn’t pick Edward because of his better price which was actually a couple hundred bucks higher but because he knew what he was talking about and didn’t try to sell me things I didn’t need. I was originally set to replace siding on just a rear, damaged wall of my garage but the old one has faded so much that we couldn’t find anything even remotely resembling that color, so I decided to have the whole thing done. I’m sure that anyone can achieve perfection over time and I’m absolutely sure that those guys have been doing it for a very long time. It was a pleasure to pay for my stupidity. wooden windows. We were considering repairing them but after two of our contractor friends evaluated the extent of damage we decided to call EDMAR for another opinion. Unfortunately Ed just confirmed that repairs would need to be very extensive, most likely even exceeding the new window installation cost. There was also a question of possible frame damage inside the wall so we decided to play it safe, remove all windows including frames, and install new ones. They gave us very good deal on vinyl windows with lifetime warranty and did excellent job on installation inside and out. We also signed with them a new siding installation contract for the beginning of April. If you’re shopping around for new windows you should give EDMAR a call. that nobody got hurt. Unfortunately that tree shattered two of my rear porch windows and ripped off a few pieces of siding when falling down. Siding damage was very painful because I just had it replaced last fall, as for my windows, although they were old, I’m happy I couldn’t afford to have them changed at that time. Long story short, my nephew recommended EDMAR for the repair job since they have finished working on his house in March. It was really a very small job when I look at it now, they took out those old broken windows, put in two new ones, and installed 3 siding panels. Fortunately my windows were standard size and available without special ordering, I also had 5 pieces of siding left from the installation last year so I didn’t have to look for that either. They were in and out in a couple of hours, left my back porch clean and brand new looking. Good job! I was surprised that they took job for only 2 windows. So, this is what she asked me to say: “Thank you Mr. Edward for taking such a good care of my living room window. You have a wonderful crew of people who really know their jobs. They kept my place clean during the entire installation and even replaced some of the old, stained window trim. I now have extra space to put my flowers and more light coming to the front room. It was nice to have professionals working for me. I really appreciate it.